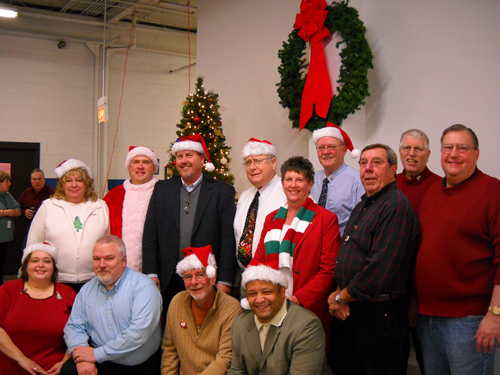 Members of the Oak Lawn Rotary recently hosted a holiday party for Park Lawn’s participants with intellectual disabilities at Park Lawn’s workshop location in Oak Lawn. The Rotarians once again generously donated a healthy lunch from Subway that Park Lawn participants always express their enjoyment with the smiles on their faces. They also donated gifts that included money skill games for the day program classrooms and 3 Nintendo Wii games for the workshop to celebrate the upcoming holidays. Santa Claus also stopped by to give holiday treats and sing along with holiday songs. To show their gratitude towards the Rotarians and Santa, the Park Lawn Players performed three skits to Holiday tunes. Oak Lawn Rotary was chartered on April 3, 1961, and sponsored by the Blue Island Rotary Club, Oak Lawn Rotary is a very active organization. Currently made up of about 25 members, it helps to support community groups including Park Lawn and several more. The Rotary motto is service above self. More information about the Oak Lawn Rotary is available at www.clubrunner.ca/oaklawn. Photo: Oak Lawn Rotarians spread Christmas cheer to Park Lawn participants with intellectual and developmental disabilities. Back L-R: Oak Lawn Rotary Members Monica Boatman; Larry Deetjen; Tom Smyth; Tom Salmon; Jane Quinlan; Bill Goetz; Ray May; Jim Sweeney; George Vlasis. Front L-R: Oak Lawn Rotary Members Sandra Bury; Adam Woodworth; Park Lawn Executive Director and Oak Lawn Rotarian Jim Weise; George Sheets.